Description - Thsea otter is a weasel-like creature that has a long, thick tail with dense, dark brown to blond fur, the fur on the head is paler. The head and neck lighten with age, turning almost white. Average weight is 70-100 pounds. Distribution - Naturally occurring from the Aleutian Islands to Alaska, the sea otter has been transplanted to the southern part of Canada's Pacific coast. 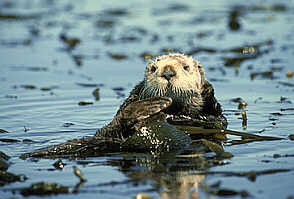 Biology - The sea otter feeds on clams, sea urchins, abalone, crabs, mussels, starfish and fish. They swim belly up with their front paws in the air, using the webbed hind feet for propulsion. They dive for one to two minutes but can stay down for up to five minutes. They "raft" together in sexually segregated groups of up to several hundred animals. Their dense fur of the sea otter has up to 100 000 hairs per square centimetre which traps tiny air bubbles in it which repels moisture and keeps them warm. The female has one pup every 1-2 years. The sea otter population was nearly decimated by the fur trade and they now are a protected and endangered species. Their sensitivity to environmental pollution keeps them at risk.